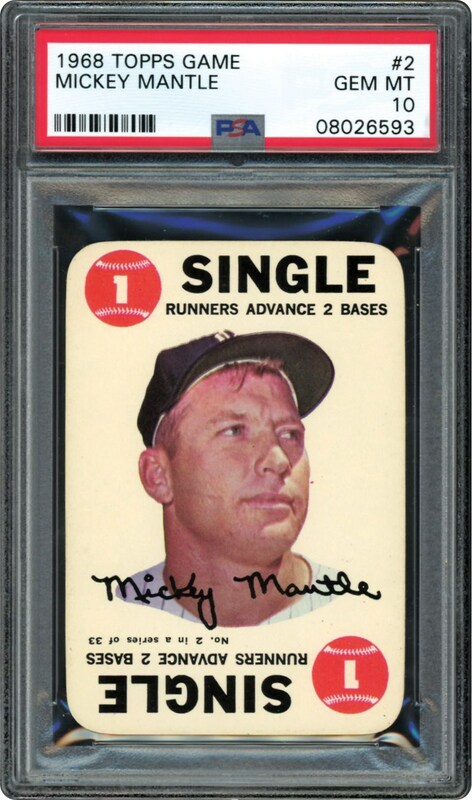 Lot # 105: 1968 Topps Game #2 Mickey Mantle (PSA Gem Mint 10) – “1 of 4” “Gem Mint 10” Examples! 1968 Topps Game #2 Mickey Mantle (PSA Gem Mint 10) – "1 of 4" "Gem Mint 10" Examples! The 1968 season would sadly mark the end of one of the most storied baseball careers in our National Pastime's glorious history. After 18 legendary seasons, the immortal Mickey Charles mantle would finally call it quits, with his aches/pains and diminishing skills ultimately dictating this heart-wrenching decision. It therefore comes as little surprise that many vintage collectors widely pursue his cardboard mementos from that final '68 campaign, with this unfathomable PSA Gem Mint 10 1968 Topps Game Mantle offering sharing the spotlight with a mere 3 other examples as the 'best of the rest!" Consisting of 33 subjects, the 1968 Topps Game set cards measure approximately 2-2-1/4" x 3-1/4" and were issued as inserts, with the cards intended to be utilized for a card game. The obverse sides portray the player's portrait image, facsimile signature and a specific baseball action (e.g., "Home Run", "Single", etc.). 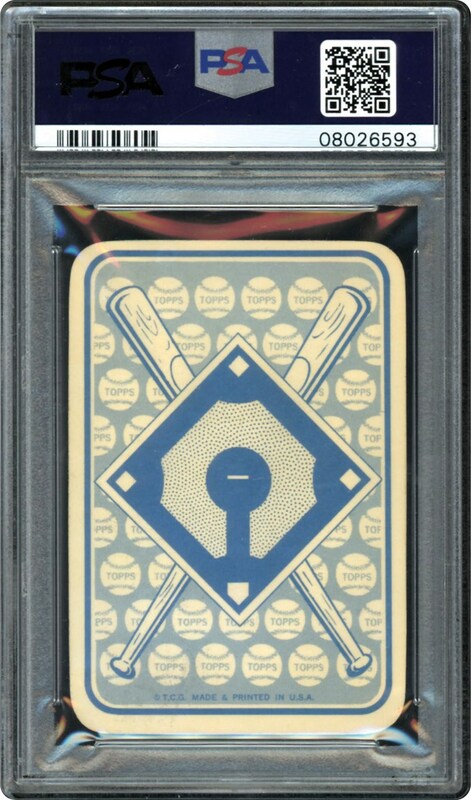 The verso's reveal an elaborate blue hued baseball diamond and crossed bats design with many of the game's illustrious stars included in this somewhat scarce issue (Mantle, Aaron, Clemente, Mays, Carew, Rose, etc.). Of course, the most valuable subject is the iconic Mantle, with his classic "headshot" exhibiting immaculate-like hues, and a pristine blinding white background. Additional compliments include extremely bold black "SINGLE" and "RUNNERS ADVANCE 2 BASES" captions, a likewise imposing facsimile signature, and a pristine blue hued verso. Pack fresh in every conceivable way, its impeccable technical attributes irrefutably justify the pinnacle "10" assessment that has only been achieved by a microscopic-like 0.2% of the nearly 2,000 PSA encapsulated examples!